If you have been natural for a few years more than likely you have heard of the LOC method by now. The famous moisturizing method, coined by Alikay Naturals Founder and CEO Rochelle Graham , has become super popular in the natural hair community. 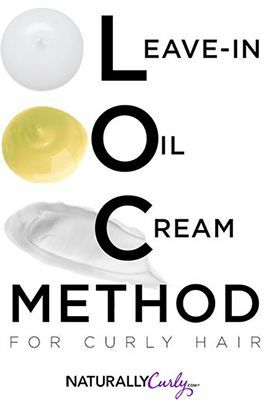 The LOC method, which stands for liquid, oil and cream, is used to seal moisture into the hair. Often cited by naturalistas as a staple in their regimen, hair companies have also begun to use the LOC method to their advantage, even promoting products that align with the method. However, if you are still a little lost on how to apply the LOC method to your natural hair regimen here are a few frequently asked questions. What exactly is the LOC method? LOC is an acronym for liquid, oil, and cream. It is a 3-step product application process used to seal moisture into the hair by layering products in acronym order. The liquid product serves as a foundation for moisture. Oil is used second during the process as a way to seal the moisture into the hair. The third and final step, cream, is used for styling and definition and can also be used to further seal moisture into the hair. What products should I use for each step? Liquid: water, leave-in conditioner, curl refresher, or hydration spray. Some choose to also start with freshly washed hair and then proceed to use an oil and cream. Oil: carrier oils such as coconut oil, castor oil, avocado oil, jojoba oil, olive oil are best. Carrier oils are suggested because essential oils are too light to seal moisture into the hair. Essential oils also evaporate quickly and are best used with a carrier oil to “carry” the oil onto the scalp and skin. Some choose to use natural butters like shea butter or mango butter for this step as well. Cream: curling cream, twist and define cream, moisturizing creams, etc. What are the benefits of the LOC method? Moisture retention is the top benefit of using the LOC method. Moisturized hair leads to less breakage because the hair is more pliable for manipulation, which in return also means less shedding. Applying products through the LOC method allows your hairs to remain moisturized for longer periods of time without the need to refresh the style. When it seems like your hair dries out after one day, the LOC method can provide up to 2-3 days of hydrated hair is applied correctly. What is LCO? And is this method better? LCO is a similar method used by applying the liquid first, cream product second, then the oil-based product as the third step. Several women prefer this method since most creams are water-based products. By using the oil-based product last, some believe this will ensure all of the moisture is locked into the hair. Both the LOC and the LCO method work well. This is more of a personal preference than golden rule. My suggestion: try both to see which method works best for your texture. Should I use the LOC method every day? This is also a personal preference; however, application of the LOC method depends on how much product is used on a daily basis. The last thing you want is a ton of product buildup, which will prevent other products and ingredients from penetrating the hair properly for conditioning. In an attempt not to load your hair with too many heavy oils and butters one option is to refresh hair with just a liquid and cream to revamp twist-outs or braid-outs. This will get at a few more days out of your style before wash day rolls around again. Don’t forget to incorporate a clarifying shampoo into your regimen if you are using heavy oils and butters, especially with multiple applications between wash days. Do I need to use both an oil & a cream? Since we know each set of hair is different due to texture, density, and porosity, it is best to find a regimen that works best for your hairstyle. I often use two parts of the method depending on the ingredients. If I am using a heavy shea butter based product that has a lot of natural oils already infused, all I need to add is a liquid. Just the liquid and butter is enough to seal moisture into my strands for the next few days. Overall, there are several natural hair regimens and methods used to maintain healthy hair. From DIY protein conditioners, to henna, banana, and honey deep conditioners to tea rinses. There will always be something new to try. Figure out what works for your hair and work from there. Do you enjoy the LOC method? Why or why not? If no, what other methods do you use?